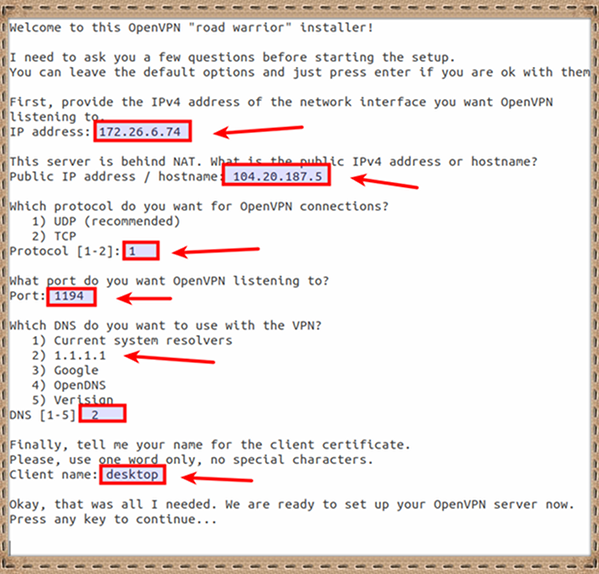 Introduction OpenVPN is a full-featured SSL VPN (virtual private network). It implements OSI layer 2 or 3 secure network extension using the SSL/TLS protocol. It is an open source software and distributed under the GNU GPL. A VPN allows you to connect securely to an insecure public network such as wifi network at the airport or hotel. VPN is also required to access your corporate or enterprise or home server resources. You can bypass the geo-blocked site and increase your privacy or safety online. 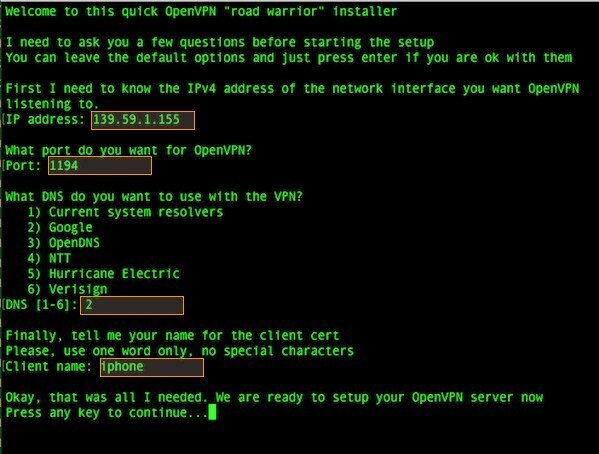 This tutorial provides step-by-step instructions for configuring an OpenVPN server on Ubuntu Linux 18.04 LTS server. Public static IP address directly assigned to your box and routed from the Internet. For example, Linode, Digital Ocean, and others gives you direct public IP address. Private static IP address directly attached to your server and your server is behind NAT with public IP address. For example, AWS EC2/Lightsail give you this kind of NAT public IP address. The script will automatically detect your networking setup. All you have to do is provide correct IP address when asked for it. To avoid problem always choose DNS as 1.1.1.1 or Google DNS. Those are fast DNS server and reached from anywhere on the Internet. How do I start/stop/restart OpenVPN server on Ubuntu 18.04 LTS? Connection to 104.20.187.5 1194 port [udp/openvpn] succeeded! If not connected it means either a Linux desktop firewall or your router is blocking access to server. Make sure both client and server using same protocol and port, e.g. UDP port 1194. Congratulations. You successfully set up an OpenVPN server on Ubuntu Linux 18.04 LTS server running in the cloud. See the OpenVPN website here and Ubuntu page here for additional information. But in general, such “quick setup scripts” need to be used with utmost carefulness and carefully reviewed before running them. 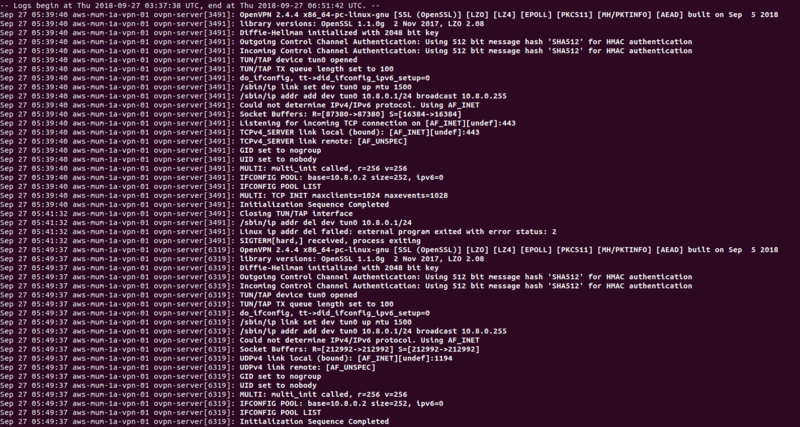 Running random scripts from the Internet as root is a receipt for disaster if not carefully reviewed. Which is why the OpenVPN community recommends to go through this “Getting Started How-To” instead of various blog posts or “simple scripts”. yes, I will cover direct setup. Did you look into another script https://github.com/angristan/openvpn-install/blob/master/openvpn-install.sh ? This one seems to address most of your concern. What do you think?